9 ounces pizza dough I used the dough on this site, Pizza Huts Dough, this made 2 big calzones. Heat the olive oil in a large pan over medium heat. Add the shallots and garlic and cook until the shallots are softened, about 5 minutes. Add the carrots and continue cooking, stirring occasionally, until the carrots are softened. Add the mushrooms and cook for 10 minutes. Add the white wine and dried herbs, season with salt and pepper, to taste, and continue cooking until the wine has cooked off. Remove from the heat and set aside to cool slightly. In a large mixing bowl, combine the cheeses. Once the mushrooms have cooled slightly, add them to the cheeses and stir to combine. Season with salt and pepper, to taste, and set aside. Generously flour your work surface. Using a floured rolling pin, roll the pizza dough out into a 12-inch circle. Lightly brush the surface with olive oil. Transfer to a pizza stone or greased cookie sheet. Top half of the dough with the mushroom-cheese mixture. Wet the edges of the dough and fold over to form a calzone. Pinch the edges shut. Brush top of the dough with olive oil. Bake until the calzone is golden brown, for about 20 minutes. 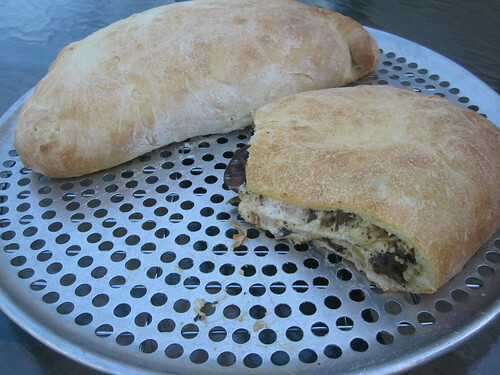 the dough and filling made 2 big calzones.